I HAVE ALWAYS STAYED AT CABIN USA, HOWEVER, THIS TIME THERE WAS A FEW ISSUES. WE HAD AN ANT PROBLEM AND ONCE THAT WAS SPRAYED,THERE WAS ROACHES CRAWLING FROM THE REFRIGERATOR AND STOVE. ONCE THEY SPRAYED AGAIN, THERE WAS A ROACH CRAWLING IN THE THEATER ROOM. WE HAD TO MAKE SURE EVERYTHING WAS TIGHTLY SEAL. i HAVE NEVER EXPERIENCED THIS IN ALL THE TIME i HAVE STAYED WITH CABIN USA. I WILL STAY WITH THEM AGAIN AND I WILL RECOMMEND THEM AGAIN. THIS COULD HAVE CAME FROM THE PEOPLE THAT STAYED THERE BEFORE. I WOULD RECOMMEND THAT THEY THOROUGHLY SPRAY THE CABINS AFTER GUEST DEPARTS. The only issue we had is that the Wi-Fi hardly ever worked and the ability to watch all TVs at one time . The cabin and the amenities were amazing. We will stay there again ! Nice spacious home with great amenities. Fit 12 adults comfortably. Would like to see better WiFi and television. The place was awesome! Their were plenty of towels and soap for all 16 in our party. The kitchen also had all the pots and pans we needed to cook dinner every day. The blender, mixer, waffle maker, and muffin tin were all nice pluses we didn’t expect. The WiFi was slow so don’t go here expecting to download or stream anything because it’s hit or miss. Our group actually enjoyed this because it kept all of us away from our phones because cell service was also not bad to non existent depending on where you were. The pool was warm but it definitely helps to roll the cover onto it when it’s not being used. I would recommend this cabin to anyone looking to have a nice trip with kids. The cabin is only 15 minutes from The Island so you’re never to far from fun outside the cabin. Everyone in our group would recommend this cabin. Me and my family loved the cabin ,it Was ABEAUTIFUL CABIN,the game room was nice,rooms had lots of space, the decoration was nice too,the bonfire u can expend the whole night without worrying about a bear it has almost everything we needed. Except for: There is no Iron,or iron board so you have to bring urs , the Internet dont work its too slow,we wanted to use the teather but we couldn't cuz the internet was too slow that u can't even get to sign in on Netflix or Vudu.The pool is big,deep and beautiful but it doesnt stay warm.there is not much light on the outside (drive way entrance side) The road to get to it its really bad at night so i would recommend if you ever rent this property bring all u need and get there bfore dark and dont go out at night .at night the road its dangerous n confusing .The other thing i didnt like was that the control remotes were switch and u can only see 3 Tv's at once and there is 6 rooms . i had to activate 2 of the control remotes to 2 Tvs , i just google how to and vuala got it work, front door make sure u close all the way ,pull it hard or wont close .But other than that we had an amazing stay, if u dont care about internet at all then this cabin is what you need .i recommend it 99.99% . Pros - Beautiful new cabin, space was outstanding, large kitchen, new appliances and amenities. Beautiful pool, comfy beds. Plenty of towels, blankets, sheets to use. Cons - Unfinished community, construction happening on various places. Location can be hard to find at first, need better direction and more visible address. We had a guest knock on our door thinking it was his cabin due to non visible address. Wifi is a hit or miss, don't expect to have smooth wifi connections. Showers need a soap holder and could've been cleaned better. There were yellow spots and hair in my shower upon arrival, but that was the only area I saw that needed cleaning more. Spider webs all around the cabin, that could've been removed also upon arrival. We had to fight through spider webs to get inside the cabin. Overall would I stay again....Yes. The minor infractions would not affect my stay. 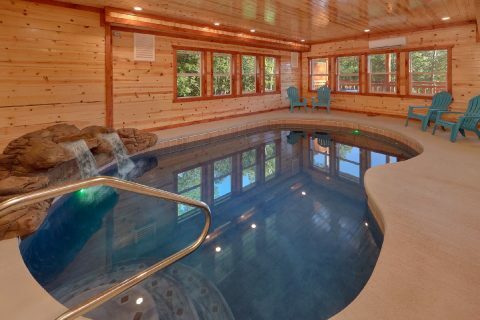 High Dive is a beautiful new cabin, offering plenty of room for a large group. We enjoyed the new kitchen, movie room and fire pit. Great location with beautiful mountain views. Toilet up stairs leaked down on living room seat. Smoke detector in bedroom just hanging. Some of the tv’s didn’t work. Toilet in game room leaking around seal. I moved the seat when the toilet started leaking to find cookies and chips under it. The towels that was supposed to be clean wasn’t they had just been folded nice and neat.the pool didn’t stay warm and the fountain to it didn’t work. I really liked the cabin but there was many issues. My family and I loved everything about “High Dive”...The cabin is really nice and spacious.. The amenities are everything that a family will need to stay entertained!! We absolutely loved our stay and already looking forward to visiting again next year! The cabin was beautiful! We had an issue with the air conditioner on the second day but I called and they came out less than 30 mins later! The only thing I wish would have been better is the WiFi. Yes there are 2 systems but they ran very slow!! The pool was incredible. We had to drag the kids out everyday to go explore, and they would be back in as soon as we got back! It is worth the money! Great place, bad sides are, no where in any showers to put soap or anything! Had to sit in floor. Two tvs didnt work and water leak in ceiling in living room. Other than that was an awesome place!